Was it an Anchorman too far? Ladies and gentlemen, can I please have your attention. I’ve just been handed an urgent and horrifying news story. I need all of you, to stop what you’re doing and listen. Cannon- No, the verdict is in! The streets, I mean, the box offices will rain with Burgundy’s blood. A mixed bag. From the get-go, it was random, mental and funny as hell. It ticked all the boxes; the epic voice over, the crazy soundtrack and all the original cast back. But bigger and better? Well . . . The first 45 minutes were epic. I was worried that this sequel would suffer from a case of “all the best bits in the trailer” syndrome BUT the Winnebago scene was so much funnier than I thought it would be. In fact, some of the trailer tasters weren’t even used. For example when the news anchor team mistake a gay guy for a vampire. It was always going to be tough to top the original. It was a sleeper hit that, by any standard, shouldn’t have worked. I mean, come on. News anchor street brawls, bear fights and some of the most insane quotes possible! Unfortunately, this time around, it fell short of the hype. I couldn’t believe it had been over a decade. The cast certainly hadn’t lost any of their mojo BUT once the two hour marker had passed, my smile had gone. That frenetic hilarity of the first half had evaporated into a dull and drawn out affair with the jokes getting worse. David Koechner’s Champ Kind originally annoyed me in the first one BUT this time around, he was fantastic! BUT Steve Carrell, on the other hand. The legend that was Brick Tamland. He infuriated me the most. He may have delivered the odd moment BUT the dull love subplot with Kristen Wiig’s Chani (Bridesmaids) really spoiled things. It wasn’t what I expected at all. 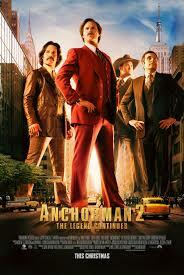 Anchorman was always ridiculous but enjoyable. Adam McKay and Will Ferrell take this second outing to a whole new level of crazy that just doesn’t quite come off. The outcome of this film will depend on your level of expectation. Some will be left disappointed and peeved while others will love it. BUT for me it’s NOT as good as the original. There was another news fight brawl and the cameos! My God. I couldn’t believe how many people popped up in those five mental minutes. However, the longer it went on, the sillier it got. It was too much and withered away after a funny if stupidly long build up. As the film carried on, the gags were very hit and miss. Some were just random as hell and baffling while others had me in tears. There was barely any Baxter this time round. I don’t want to spoil too much BUT it was still very watchable and for a good portion, I enjoyed it. BUT I wouldn’t hold out for a third outing. IT IS DEFINITELY WORTH A GANDER IF YOU’RE AN ANCHORMAN FAN OR JUST A FAN OF ANY OF THE CAST, JUST DON’T SET YOUR SIGHTS TOO HIGH! (I’m sorry, someone put it in capital letters and an exclamation mark, I thought I had to shout it).